Circumcision & our Bond with G-d.
Maimonides writes the reason we circumcise our boys is only because G-d commanded us to do so. However, the blessing made at the time of the performance of this Biblical commandment is, “ to bring him (this child) into the covenant of Abraham our forefather”??? Is this deed related to G-ds commandment, or to our forefather Abraham? How great is the circumcision! Behold, our Patriarch Abraham was not called "perfect" until he was circumcised, as [Genesis 17:1-2] states: "Proceed before Me and become perfect. And I will place My covenant between Me and you." Anyone who breaks the covenant of Abraham our Patriarch and leaves his foreskin uncircumcised, or [although he was circumcised,] causes it to appear extended, does not have a portion in the world to come, despite the fact that he has studied Torah and performed good deeds. The Torah mentions only three covenants regarding all its mitzvot (commandments), as [Deuteronomy 28:69] states: "These are the words of the covenant that God commanded... in addition to the covenant that He established with you in Chorev." In addition [Deuteronomy 29:9-11] states: "You are all standing today... to enter into a covenant with God, your Lord." Thus, there are three covenants. And here is the explanation….. 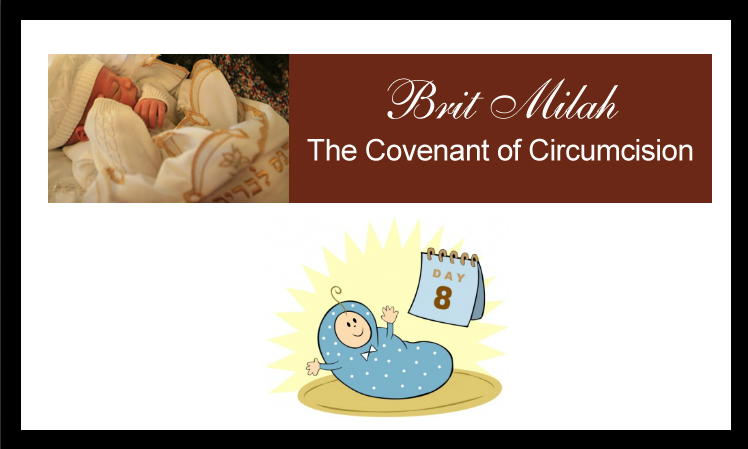 In the observance of the Mitzva to become and to be circumcised, (as in all commandments) there are two concepts being fulfilled and accomplished. There is the general covenant with G-d that is motivating the performance of this act, and the specific deed through which the general connection is made. A husband strengthens his general bond with his wife in many ways, sometimes through bringing a bouquet of flowers. Alternatively, in spiritual terms, prayer, has an influence on the entire connection of a person with G-d, in all areas of one’s life, through the performance of this one specific commandment. This is why the Rambam – Maimonides quoted above, at the end of the rules of circumcision and when summarizing the law he writes the overall and all-encompassing idea of the circumcision, is to distinguish the Jew from the rest of the world and this explanation is connected specifically and only between the Jewish people and G-d. In the second and continued discussion regarding the virtue of this commandment he speaks of the 13 advantages and outstanding merits in this Mitzvah over any of the other ways of connecting with G-d. It is true, we perform Mitzvos because only through doing what G-d commands us to do we are able to connect with the Infinite Master of the universe. When making the blessing over THIS commandment, we mention Abraham who imbues extra meaning and for being the one, through his self-sacrifice against an entire world who was against him and he nevertheless demonstrated his faith in G-d, we perform this commandment as the first and beginning of all commandments. Knowing is not enough, we must also PLACE it in our heart. The Bible is very aware, that what we have up in our heads on its own, isn’t enough to influence our behavior. How many of us know it is bad to eat certain foods and we do it anyway. How many know that smoking, drinking in excess, or other examples are detrimental in our lives, and we do it anyway. After a person acquires knowledge, it takes a separate effort to push that knowledge down the narrow straights of the neck, and have the knowledge, reach our heart, in order to provoke an emotion strong enough, that we should feel actually moved by the positive or negative consequence of doing or not doing. The knowledge and awareness must penetrate deep into our hearts, so that our will and desires, together with our emotions will be totally in line and directed by this awareness. This does not come easy and takes great effort. The distance between knowing and the knowledge influencing our hearts, is as far as the distance between knowing and not knowing. The difference, is between those who say they believe, and those who say, they “really” believe, meaning, the belief has penetrated deeper than just a superficial faith. 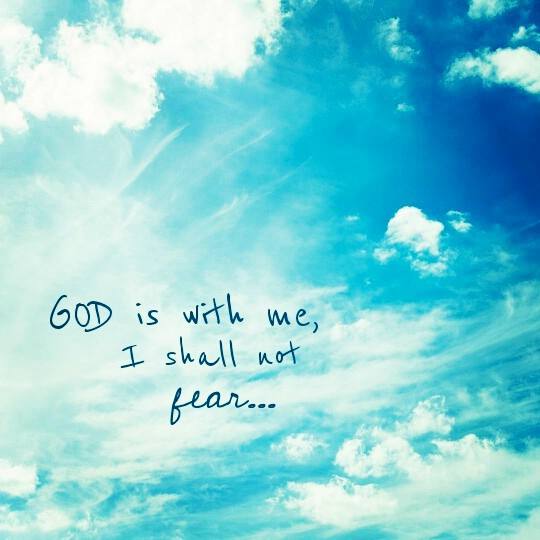 As the verse directs its instruction to us it is saying, “And you shall know, today”. Every word is deliberate in G-ds book the Bible. There is not even one letter redundant and unnecessary. The Bible is saying, “And you shall know” - from the “today” – i.e. the occurrences and happenings of every day. A person who cares to know and place it in his/her heart, can see the providence of G-d everywhere and in everything, when he observes and notices all the “coincidences” and unexpected “miracles.” When a person trains his mind to see Divine Providence in everything, the facade of nature and professed predictability becomes almost like an interesting joke, and is uncovered for the “truth” which is, at any moment anything can change because ultimately it is all in His control. 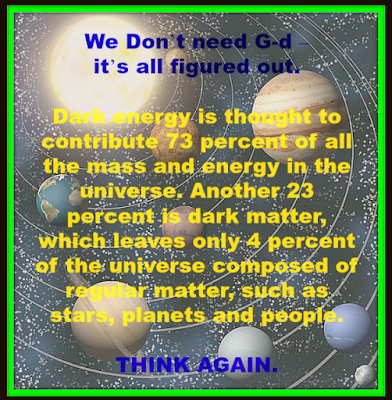 There are many levels to our faith in G-d.
#1, The most basic is to believe that there is one G-d. He exists, and there is no other besides him. #2, A higher and deeper level in this faith, is that there is no other authority or power in the world outside of this G-d. Not the employer, or the government, or money etc. #3, The deepest level in faith from the verse mentioned above, is that there is no other existence, besides G-d. “There is none other besides Him.” The world and the universe have no substance of its own outside of G-d.
What appears to our eyes as the world and the universe, is an expression of His existence hiding under the trick G-d made for the sake of giving us free choice, we call, “the laws of Nature.” G-d is the existence and reality of everything. The only true underlying energy behind and the reason for everything. In a very subtle way, when a person gives power to anybody or anything in the world, as if it can affect his life and interfere in his relationship with G-d this is a form of denying G-ds oneness and unity in the world. It is a form of idol worshiping by attributing some degree of power to anything outside of the invisible omniscient and omnipresent G-d. Literally, this verse is talking about the portion allocated by G-d as support for the Priests in the Temple, called Challah. In Hebrew, the word for dough (arisah) can also mean “beds”. The Torah would be saying then, early in the morning, right when you come out of bed, one should dedicate the beginning of the day to G-d in prayer and gratitude. The Talmud says, anyone who gives Challah - this first portion to G-d, it’s as if they negated idol worshiping, while anyone who does not give Challah, it’s as if they worshiped idols!!! Heavy words. The negation of idol worshipping is a cornerstone and foundation of our faith. So, how do we ascribe what appears to be the observance of one commandment with the foundation and main pillar of our faith??? Dough represents sustenance and life itself. To make dough one must plow the ground, place the seeds, harvest the kernels, make the flour, etc. According to nature, much effort on the part of a person. It would be very easy for a person who sits down to some bread after working so hard to think that what he has is a product of his own hard labor and he is self-made. Even while believing the world had to be made by an infinite intelligence, and reflecting on the circumstances of life, a person concludes that certainly G-d is behind so much of what happens, he may still attribute the results of his own very hard labor to himself. If a person thinks all that he has was earned is to his own credit, there is no reason to give away what is mine to someone else. Even if I do give anything away, it has to be self-serving. This then is precisely the theme and concept of idol worshipping. Idol worshipping is when a person attributes power and influence in his life, outside of G-d. When a person thinks, there is G-d and then, there are other influences to either blame or give credit to, such as my competitor, the enemy, the employer; he denies G-d in certain areas of his life and puts his faith – worries, in “Idols”. 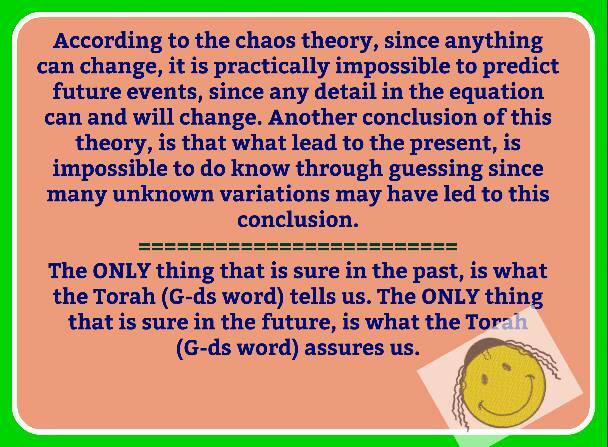 When a person believes everything in his life is the direct results of an infinite G-d “there is nothing else but Him”, this would mean, whatever a person has, the circumstances that he is in, is totally to the credit and attributable to G-d. If I understand, my parents brought me into the world, educated me, cloth me, gave me the money for my business, advise me etc., I don’t have a problem with giving them FIRST their due and then, enjoying some for myself. A person who worships Idols has many gods, and his world is very fragmented. There are so many influences, and he can be torn and dragged into so many directions. A person who realizes and understands that notwithstanding his own effort which is also to the credit of G-d, everything around him is always influenced by the will of G-d, this person will have an integrated and cohesive life. That is why according to the law; the portion dedicated to the Priest must come not from the flour – the fragmented particles, but from the kneaded dough. The unity of one’s belief “G-d is one and everything all around is only Him”, leads easily to dedicating time and resources to G-d, to helping others first, for its own unselfish sake. Maimonides Advice soon coming out in Print. 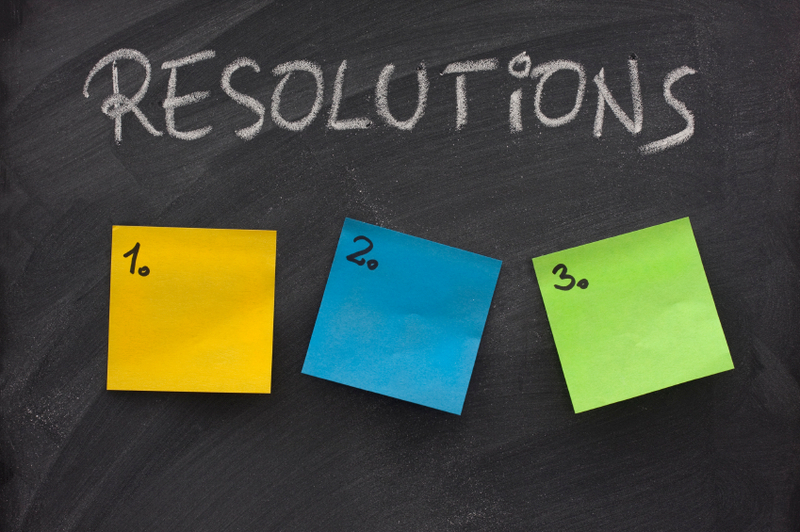 Good Resolution versus Bad Ones. “Where a person mind is, that is where his soul is”. His life energy dwells there. Therefore, when a person makes a sincere decision to do something, he is already there and the deed was completed in the world of thought. When the resolution is sincere, all the faculties needed to accomplish the deed, were already drawn in the direction of his goal and commitment, and as far as the person is concerned, he already is there -- at the goal. As far as the physical world is concerned, sometimes G-d may have other plans. When we say G-d considers and attaches the thought to the deed, this includes even those acts, which are presently over and above the capabilities of this individual. If the resolution is sincere with all of one's soul, G-d considers and attaches this thought to the performance of the deed -- meaning that the strength is given from G-d, and if necessary new channels are opened, to fulfill and reach this resolution. This is true only for positive things, because inherently the nature of everyone is to do good. Thus, when a positive resolution is made, it is in harmony with one's G-dly good soul -- and the good thought is in synchronicity with the deepest parts of ones soul, the G-d within, to open if necessary whatever it takes in order to accomplish the deed. However, when one thinks evil, it is only on the exterior and does not come from deep inside, and isn’t in harmony with the universe which is good. Therefore, the person's bad thought is all alone and goes no further than the bad thought that it is. In ancient Babylonia, a ruler made evil decrees, including that it was forbidden to fast and pray to G-d. The Rabbi of the time advised the people to decide that they would fast when it was possible, and the thought alone would help avert the decree from G-d. The code of Jewish law says that when a person is being pursued by an enemy and merely decides to fast in prayer, immediately this will help him. The moment he thinks and still has not done any fasting, he receives the consideration as if he fasted. Drawing from a verse, the Talmud says, when a person makes a bad resolution, G-d will at times, re-arrange circumstances so that his evil plan will not materialize. 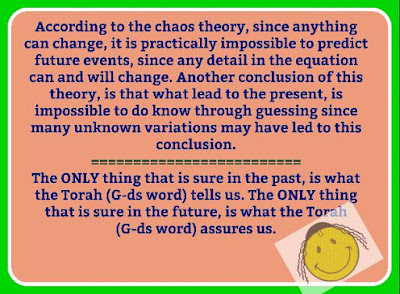 When a person however, makes a G-dly positive resolution, this can influence actual reality, and G-d will re-arrange matters, if necessary, so his resolution can be materialized. Once the Holy master, Rabbi Yosef Yitzchak, asked a follower of his to pledge that he would print a certain collection of books. Since the follower had absolute faith in his G-dly teacher, he accepted, even though the cost was way beyond what he was able to afford. Not long after the pledge was made, an unexpected positive opportunity for this person arose which presented new channels of livelihood and suddenly enabled him to fulfill his pledge and become a wealthy man.